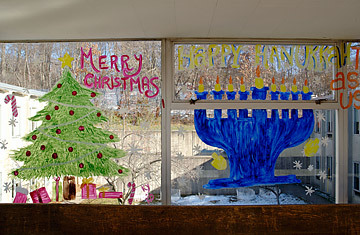 oliday greetings paintings for Christmas and hanukkah on public school hallway windows. Australian Classrooms: A Choice Between Ethics and Religion? It's a holiday ritual as predictable as Santa showing up at your local mall: overheated rhetoric about the "War on Christmas." A lowlight this year was a feature on The O'Reilly Factor about a letter from the Tennessee chapter of the American Civil Liberties Union urging school districts to make holiday celebrations inclusive. Through O'Reilly's prism, the letter  quoted selectively  was an attempt to squelch Christmas. In reality, the letter just asked school districts to avoid celebrations focusing exclusively on a single religion. It was more common sense than state-coerced atheism. Unfortunately, once you cut through the blather on cable news, there is a real, if much less discussed, problem in that public schools are skittish about teaching much about religion. Although there is little hard data, the consensus among those who study the issue is that to the extent world religions are taught, they are treated superficially, usually with the help of just a few textbook pages that have been heavily sanitized to avoid even the hint of controversy. And that's not good news if you believe a working knowledge of the world's religions and their history is an important aspect of a well-rounded education. This is not a new problem. Earlier this year, when the Pew Forum asked Americans about various religions, only about half of the respondents could answer even basic questions about Islam. And many participants missed questions about their own religions. The survey also revealed confusion about religion and schools. Although 89% answered correctly that teachers are not allowed to lead public school classes in prayer, 67% did not know that public schools can read from the Bible as an example of literature. And just 36% knew that comparative religion classes could be taught in public schools. The U.S. has a long history of tension about the role of religion and public schools. Catholic schools, for instance, exist in large part because of religious intolerance within the early Protestant-dominated public school establishment. Debates over which version of the Bible should be read in school even led to riots and deaths in northeastern cities in the 1900s, and Catholics ultimately went their own way. More recently, the issue of school prayer has ignited fierce social debates. Thankfully, we're mostly past that, and contentious church-and-state matters involving schools, such as parochial school vouchers, are largely settled except among professional culture warriors. During the Clinton Administration, a broad swath of religious and educational organizations embraced a set of principles for religious expression and teaching in public schools. Today's challenge is a subtler one of knowledge: it's hard to understand many contemporary issues without knowing religious history and the tenets of the world's major faiths. Yet that's easier said than done in today's classrooms. Here are two anecdotes that will sound familiar to a lot of teachers. When my wife was teaching high school English, assignments touching on religious issues or references in literature often led to essays about a student's love for Jesus Christ. My colleague Donna Frietas encountered the same issue teaching religion to college students  personal accounts rather than dispassionate analysis. The proposed new "Common Core" national standards could help a great deal in this area because they will make reading and analyzing texts a key skill for students. In other words, students will be required to learn how to analyze and write about a text based on what it actually says rather than on personal feelings or secondary interpretations. This should open the door for students, especially older ones, to study about religion in a more rigorous way and without crossing the church-state line. The standards alone, however, won't solve our religious-knowledge deficit. More generally, two things must happen. First, activists on the political right and left have to tone down the rhetoric. Teaching about religion is not the same as teaching religion. Schools can discuss the world's religions  not just at a superficial level (think dreidels and Christmas trees) but deeply and using the foundational texts of major faiths. In addition, teachers need better training and support to teach religion. There is too little curricular material or training available on this subject. And, of course, social studies in general are too often marginalized in schools today. Whatever holiday you celebrate  or don't celebrate  this time of year, it's in everyone's interest for young people to learn about the role religion plays in the world. Public schools can do that without running afoul of the First Amendment. Our problem is not talk-show hysterics about a war on Christmas in public schools. Rather, it's a quiet lack of attention to learning about religion in every season.